Hot on the heels of the major Apple iPhone operating system release, Google has released an update of the Android operating system. The new Android 2.2, code named Froyo in the now familiar desert-themed naming scheme, has begun rolling out as an automatic update to owners of the company’s own Nexus One phone. 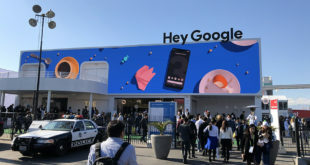 Google has also made available the source code to partners with third party handset manufacturers such as HTC, Samsung and Motorola expected to also follow with the updated OS. Many have been able to run the new Android operating system ahead of the official release with many positive reports of a substantial boost in speed thanks to the inclusion of a JIT complier which the company claims speeds up application execution between 200 to 500%. This might make Apple a little uncomfortable given the widespread reports of the iOS4 update resulting in sluggish iPhone 3G handsets. Android 2.2 is also notable for delivering the capability to run Adobe’s Flash in the new web browser which provides additional functionality on the web through interactive flash applications video streaming and so on. The new OS brings features and improvements such as a better on-screen keyboard, improved enterprise-class features for business and the ability to ‘tether’ the phone to a computer so it piggy back off the phone’s 3G data connection either via USB or a personal Wi-Fi hotspot. Google has also revealed that is activating 160,000 Android handsets per day. The figures are particularly startling given that the rate was 100,000 in May, which represents a 60 per cent boost in take up even in the run up to the launch of the iPhone 4. Many put the success down to the wide variety of cutting edge handsets available from a range of manufacturers at different budget points. In recent months the pace of third party support for Android has gathered with major phone launches such as the Samsung Galaxy S with the much-vaunted Super AMOLED display and yesterday’s Motorola Droid X launch in the US. The Droid X and Samsung Galaxy S also launched with the new Swype keyboard gesture input system. Speaking in an interview with the Guardian, Schmidt said, “We have seen a tremendous increase in adoption. We’ve also seen a growth in the number of apps available for Android – there are now approximately 65,000 compared to only 50,000 a month ago." He believes that means Android could have reached the volume necessary to become an essential mobile operating system – and perhaps the equivalent of Windows on PCs. Schmidt wouldn’t be drawn on whether Google would look to producing its own Android-powered tablet to go head to head with the iPad, like the firm did with the Nexus One handset. The open nature of Android will, however, mean that a great many handsets will be left waiting to see the OS improvements causing further fragmentation of versions of Android handsets on the market. Google claimed that this situation is improving and that major revisions of Android are expected to slow after Android 2.2.